last night, after running a ton of errands we decided to do a little after hours work on the house. 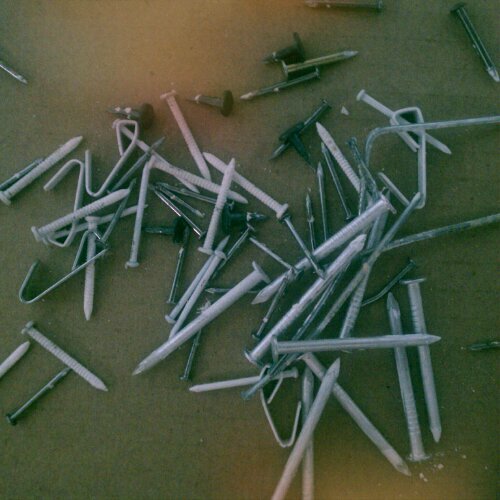 i started picking up the kitchen and b decided he would take on the task of removing the ridiculous amount of nails from the walls. after he got all of them upstairs, he headed downstairs. and then he yelled for me. wet carpet. so what does he do? pull the carpet up, naturally. b cut the wet carpet and padding out and we saw that the water was not coming from a wall. luna checked out the spot too. see how it is away from the wall? so we look up to see that there are two water spots around the recessed lighting in the ceiling. and then we make the connection that we are below the master shower. awesome. so now b gets to rip out the ceiling. fun! ah the joys of home ownership reveal themselves so quickly. oh well. the good news is that we have plenty of space that having one bedroom and/or one bathroom out of commission is not the end of the world. today is operation:get a fridge. when you live in the middle of nowhere and you have no fridge you get really hungry. also, today we are getting the carpets cleaned and the bug guy is coming. thank god. i have chigger bites in the most ungodly of places. Wow! It happens so fast!